Near Barcelona there is a small town Sant Sadurní d’Anoia known for its cava culture. 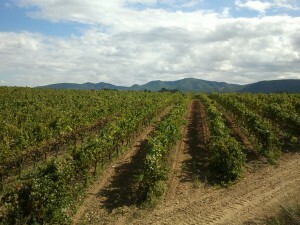 Some vineyards there have a 500 years tradition and produce an excellent cava product. Cava is a Spanish word for champagne. As long as champagne can be called only the sparkling wine produced in the specific region of France, producers of wine in Spain decided to use their own brand name which is “cava.” The name is difference, but the technology is very similar. To mark the specific technology all producers of cava put a star under the cork. Cava is a product of natural fermentation. 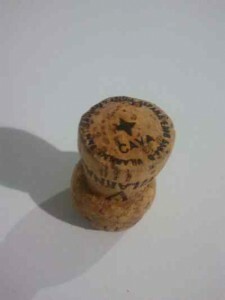 To mark the specific technology all producers of cava put a star under the cork. If you don’t see a star then most likely it is a sparkling wine with artificially added CO2. I was writing before about visiting Penedes. The region of Sant Sadurni is close to the Penedes region, but for me it has provided a different experience. Sant Sadurni, and especially its neighborhoods, is place to spend a relaxed weekend and experience excellent hotels with golf and spa, as well as tasting perfect cava. We’ve realized our visit 14 of October, where some of the largest vineyards opened their doors to the general public for free visits. Normally when you visit a vineyard in Spain you need to reserve a visit in advance in order to have a guided tour and degustation. This day was an exception. If you don’t have a car then most likely you’ll have to stay in Sant Sadurni. If you drive, then search for a hotel nearby. In our case we preferred to stay in Hotel Barcelona God Resort & Spa, because of its excellent price/quality rate, an availability of a spa and golf. The hotel provided an excellent service. Magnificent views were seen from major sites of the hotel. The spa service was on the high level as well. If you plan a visit it is worth calling hotels in advance and booking spa procedures. As for golf, there are two camps. One large, for experienced players, and another small one for people with less experience, and finally a training camp. Note for drivers: Most vineyards do not have a good street address; I mean normally an address looks like “23 km of Roadway between A and B.” It is more convenient to use GPS coordinates. For our cava tasting visit we decided to visit Vilarnau, which from the first look appears to be some new venture, but it was founded by a family with a long tradition of making cava, so it is worth visiting! Some wineries are located directly in the Sant Sadurni. You can view only the process of producing and cannot visit the vineyard itself, but still the experience is worth it. For example, Freixenet is located 50 meters from the train station, so you can plan your visit without spending the night in Sant Sadurní.